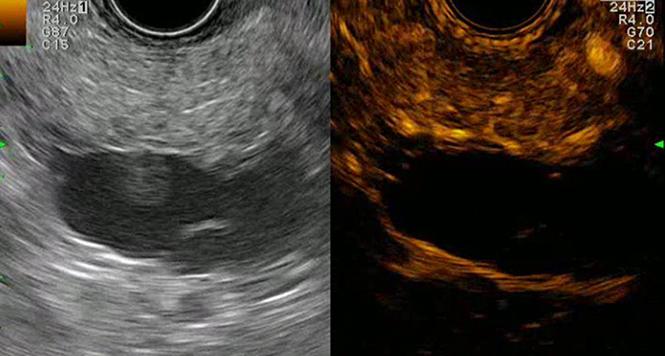 We present a case of a 46-year-old patient with an HCV-associated, multilocular hepatocellular carcinoma. Therapy with Sorafenib was discontinued as a result of serious side effects. SIRT was recommended by a multidisciplinary tumor board. Microspheres were administered twice, in February and April 2016, after appropriate preliminary examinations were conducted for each case respectively. In October 2016, the patient developed an upper G.I. bleeding. 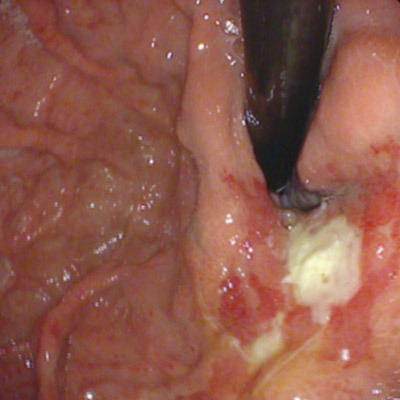 During gastroscopy a 2 x 2 cm fibrin-covered ulcer was found in the cardia, along the minor curvature. 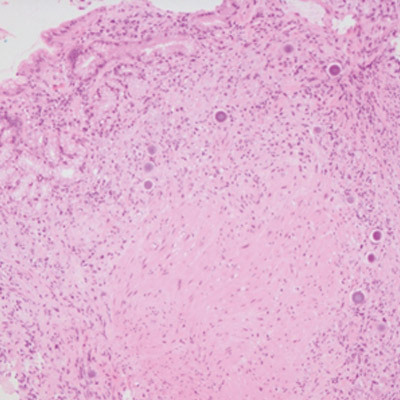 A biopsy of the ulcer was taken, and multiple microspheres were found in the histology specimen. 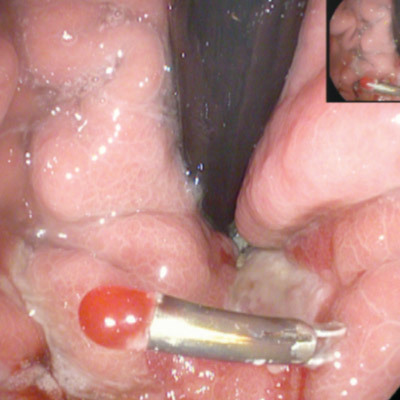 In the course of treatment, endoscopic interventions were necessary because of recurrent ulcer bleeding. 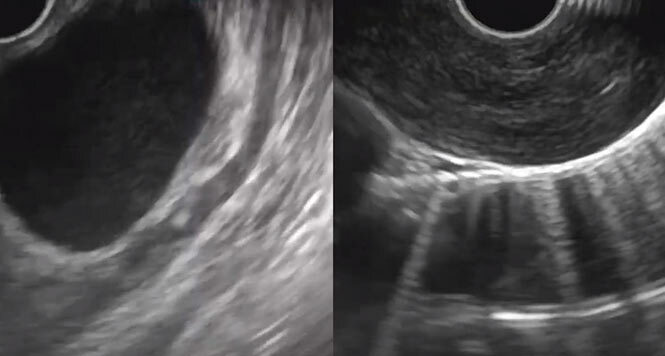 Due to progression of esophageal varices, the patient needed to be closely monitored, which allowed us to present a detailed 12-month documentation of the radiation-induced ulcer. Crowder CD, Grabowski C, Inampudi S, Sielaff T, Sherman CA, Batts KP. ‘Selective Internal Radiation Therapy-induced – Extrahepatic Injury an Emerging Cause of Iatrogenic Organ Damage’. American Journal of Surgical Pathology 2009; 33: 963–975. Sangro B, Martinez-Urbistondo D, Bester L, Bilbao JI, Coldwell DM, Flamen P, Kennedy A, Ricke J, Sharma RA. ‘Prevention and Treatment of Complications of Selective Internal Radiation Therapy: Expert Guidance and Systematic Review’. Hepathology 2017; 66: 969–982. Abdel-Rahman OM, Elsayed Z. ‘Yttrium-90 microsphere radioembolisation for unresectable hepatocellular carcinoma’. Cochrane Database Syst Rev. 2016 Feb 16; 2: CD011313 doi: 10.1002/14651858.CD011313.pub2.